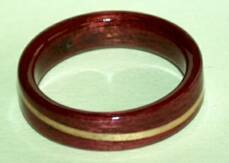 Folks have designed quite a range of wooden rings with single spiraled inlays. 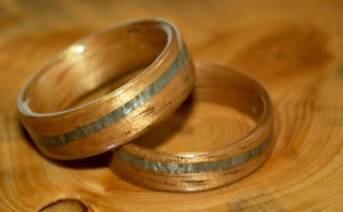 Here are some examples of single wood rings with contrasting spiraled bands. To the left; Golden Koa with single spiraled bands. Above; dark koa with a clear juniper spiral. 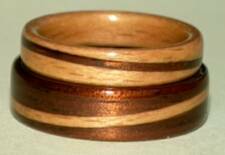 Below; Purple heart wood ring with a clear juniper spiral and bottom left rings are beech and dark koa.